We heard some music, and so went to investigate what it was. We followed the sound, which led us to the National Folk Museum of Korea, which is located within the grounds of Gyeongbokgung Palace. There we found a group of performers dressed up in brightly coloured outfits, dancing around and playing music. The Dance is known as Pungmul (풍물) and was traditionally performed as part of seasonal farm work, festivals, and religious rites. 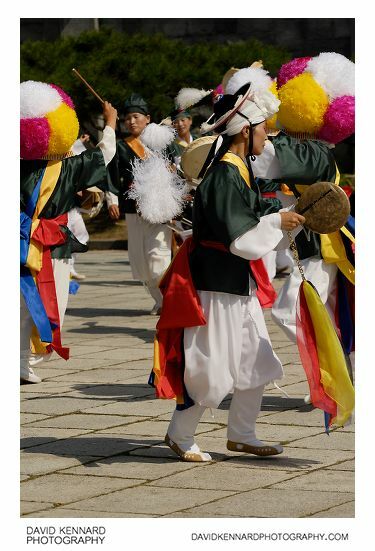 The dance was also previously known as Nongak (농악), meaning "farmers' music", but this term has dropped out of favour since pungmul is not restricted only to farmers. 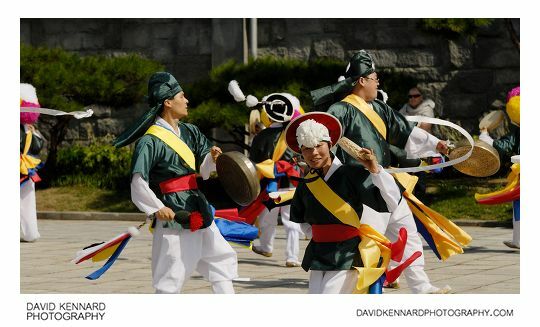 Here is one of the performers wearing a hat with large paper flowers attached, known as Pungmul kkokkal (풍물 꼬깔). They are playing the small hand drum known as the Sogo (소고). This instrument is more for display purposes than contributing to the music, as it makes hardly any sound. 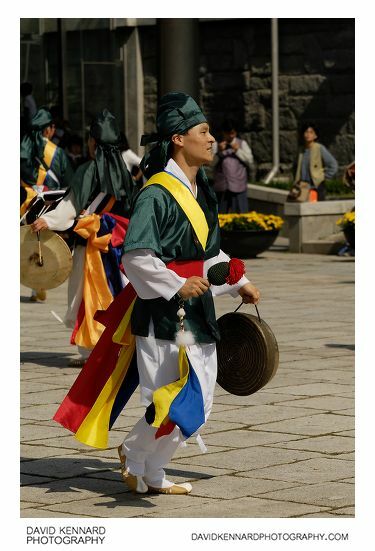 This dancer is wearing a chae sangmo (채상모), which is a hat with a long ribbon attached. Using flicks of the head, they move the ribbon around in time to the music. 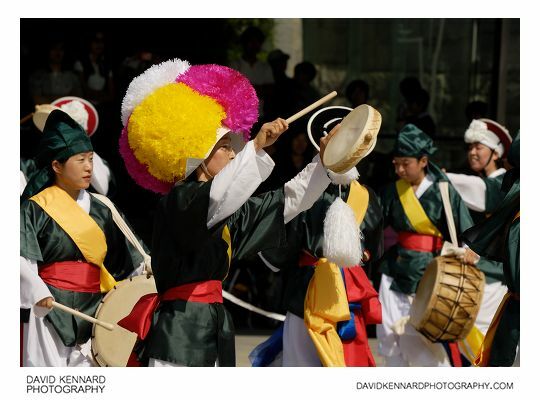 They also play the same Sogo hand drum as the dancers wearing Pungmul kkokkal. 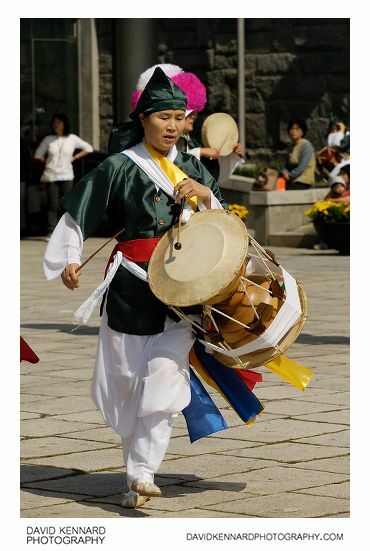 Perhaps the best known and easily recognized instrument of the pungmul ensemble is the janggu ("stickdrum"), a double-headed, hourglass-shaped drum. The body of the janggu is hollow and is usually carved from a single piece of paulownia wood (odong namu), then spun on a lathe. Janggu are customarily finished with a clear varnish or are lacquered a deep red or maroon color. Two circular drumheads made of cow, sheep, horse, or dog leather are then stretched over the bowls and are secured with rope or cotton cords. The larger, lower-pitched side of the drum is struck with a mallet fashioned from the root of a bamboo tree and is associated with the earth and female energy. The smaller, higher pitched side, in contrast, is struck with a stick carved from the stalk of the bamboo tree and is associated with the heavens and male energy. 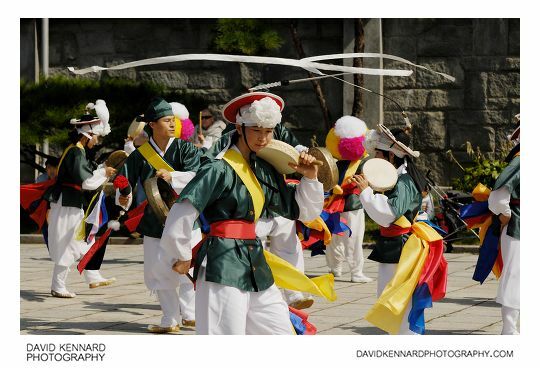 Janggu are strapped to the body securely with white cotton cloth so that both hands are free to play while dancing. 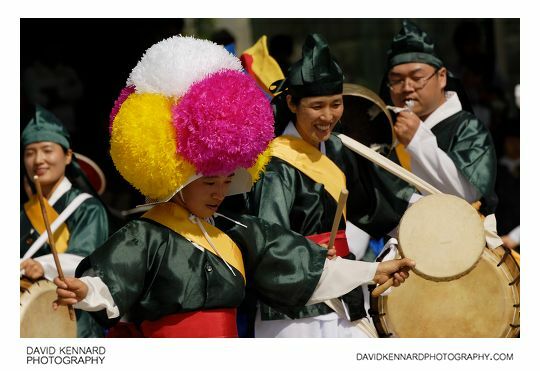 The sound of the janggu is supported by the buk, a double-headed, barrel-shaped drum. Considered the only indigenous percussion instrument in a pungmul troupe, the body of the buk is constructed with interlocking slats of wood. Leather skins (usually cow) are then stretched over both openings and laced together with rope. Tension is maintained by optional wooden chucks wedged between the rope and the body of the instrument. The buk is generally suspended from the performer’s shoulder by a long cord of cotton cloth and is struck with a stick made of hardwood. The leader of the ensemble has traditionally been the sangsoe, or lead soe player. The soe ("iron" or "metal"), also known as the kkwaenggwari (an onomatopoeic designation), is a small, hand-held gong made of brass. Soe are produced by either pouring heated metal into a mold or by forging, the latter process considered superior in quality. The instrument is struck on its front surface by a mallet held with the free hand, while the hand holding the soe manipulates the sound through a number of available damping techniques. Soe are commonly divided into male and female soe, the former generally associated with a higher and sharper toned pitch and the latter with a lower and more subdued one. It is customary for the lead soe player to play on a male soe, accompanied by the second soe player (busoe) on a female soe, continuing on in such alternation down through the rest of the section. The companion instrument to the soe is the jing, a large, hand-held gong also made of brass. 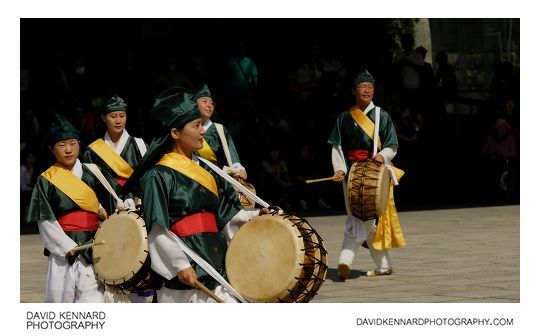 The jing is struck with a padded beater, producing a good after-tone characterized by three undulations that in Korean is referred to as sampa-eum ("three wave sound"). Jing strokes tend to coincide with the first beat (or downbeat) of each rhythmic pattern, serving as the sonic glue that binds together the rest of the gongs and drums. The sound of the jing has also been employed as a signal for retreat within the military and a means of sounding an alarm in village society. It is believed to be capable of changing the bone structure of an unborn child in the womb of a shaman. I took loads of photos of the Pungmul perfomance, but unfortunately I'm not very good at "action" photography, so the composition isn't that great on most of them. On some the focus is a bit off as well. 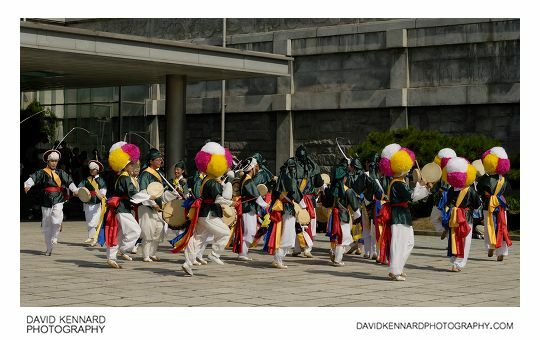 If you want to see the other photos, they're all under the 'National Folk Museum of Korea' category in the Image Library section of the website. The performance went on for quite a while, but it was very enjoyable, and it looked like the performers were enjoying themselves too. I was pretty hot just standing watching them, so dancing round while playing instruments, they must have been boiling! When the performance had finished we went into the National Folk Museum of Korea building to have a look round. I have been teaching at Seoul Foreign School for 6 years and have often seen the Farmers Dance performed but my attempts of capturing the energy and dynamism have never been successful.